We arrived in Gdynia around midnight on the 13th July… Spent the night in front of the house of Tadeuz…. We did not want to disturb Daniela and the sons. In the morning we were nicely welcomed by Daniela and we had a traditional Polish breakfast. ( goffes, cream, bread, ham etc) a heavy breakfast for me…. We decided to visit Malbork castle museum the first day. Situated some 60 km from Gdynia we drove there and spent the whole day in the castle. Wow what a place…. The Marienburg Castle in Malbork (Polish: Zamek w Malborku, German: Marienburg) is the largest castle in the world by surface area, and the largest brick building in Europe. It was built in Prussia by the Teutonic Knights, a German Roman Catholic religious order of crusaders, in a form of an Ordensburg fortress. The Order named it Marienburg (Mary’s Castle). The town which grew around it was also named Marienburg. The castle is a classic example of a medieval fortress and, on its completion in 1406, was the world’s largest brick castle. 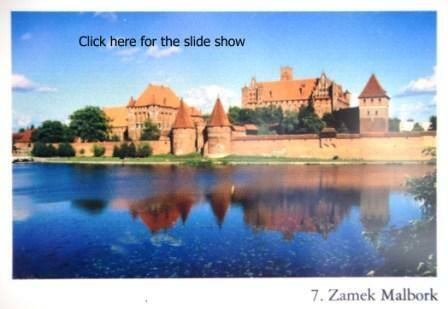 UNESCO designated the “Castle of the Teutonic Order in Malbork” and its Museum as the World Heritage Site in December 1997. It is one of two World Heritage Sites in the region with origins in the Teutonic Order. The other is the “Medieval Town of Toruń”, founded in 1231 as the site of the castle Thorn. The main attraction in Gdanzk is Divga Street… loads of shops. Restaurants and nice buildings… Amber galleries are a prominent feature in this area…..